Build your new horse barn, pole barn, shed, stable, loafing shed or run-in with one of these professional blueprints or easy-to-assemble prefab kits. Country Carpenters' Horse Barn Building Kits View carriage houses, horse barns, hobby and craft barns, salt-box garages, pool houses, garden sheds and all-purpose country barns in fine pre-cut post & beam building kits. Get a free downloadable catalog and check out the online videos and photo galleries for design ideas. 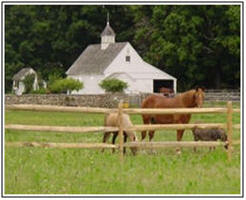 Country Carpenters, Inc. has been helping people build beautiful country places since 1974. Small Horse Barn Plans Order inexpensive blueprints for small stables with hay lofts and optional add-on stalls, tack rooms, grooming shelters, run-ins, garages, tractor shelters and workshops. 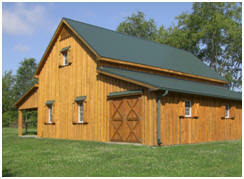 These barns are all designed for practical post-frame or pole-barn construction by architect Don Berg. Mare Motel Kits Absolute Steel fabricates and distributes a complete line of mare motels, open air barns and hay and livestock shelters that are shipped nationwide. Easy to assemble with no welding or special trades required, and fabricated out of maintenance-free galvanized steel, these agricultural structures are a great value. 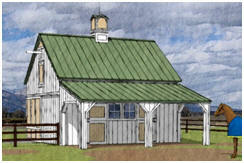 Apple Valley Horse Barn Plans Review floor plans for dozens of traditional wooden horse barns in all styles. 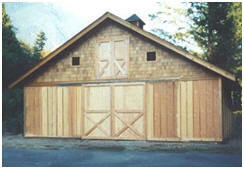 Choose barns with from one to eight stalls. 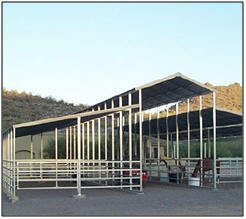 You'll find pole-frame horse barns, simple stables, run-ins, loafing sheds, hay barns and equipment shelters. Order plans directly from some of America's best known country designers. StableWise Horse facility construction requires special attention to the little details that will ensure the safety and well being of the facility's equine inhabitants. StableWise helps you to plan and create your own horse property, or to simply make better use of the one you have now. 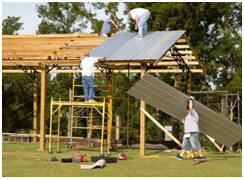 Find a Great Barn Builder Fill in some simple information about your project at Better Homes & Gardens' HomeAdvisor.com. You'll be matched with up to four top-rated professionals, in your area, who can help you build your barn. The process is easy, quick and free.